Unique art deco rocking chair with a curious “V8” motif. 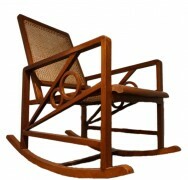 Wonderful lines surround this unusual rocking chair. Rattan cane work seating is comfortable yet makes the chair light and airy. Rare and unusual art deco specimen.